In February 2016 NetEnt created new slot game Drive: Multiplayer Mayhem which is available to play on all devices including smartphones and tablets. 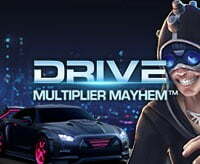 Drive: Multiplier Mayhem TouchSlotalso provided by high quality of graphics and sound effects, such as PC version. From the name it is clear that new slot was inspired by street racing where you can became a king of the underground. The slot has cheerful music and rich functionality with many features. Drive: Multiplayer Mayhemhas 5 reels, 3 rows and 15 pay lines. Players are able to bet on different levels from 1 to 10 coins per line.The lowest bet per spin is £0.15and the highest is a £75.00per spin, so the slot will be suitable for all players and give you up to £90,000 in wins. Multiplier Wilds: Wilds can appear on any reel and performs its eternal function of substitution other symbols. But the most interesting thing is that from time to time wild symbol appears with the multiplier showing the coefficient by the number credited to the reel itself.Multipliers can vary from 1X to 5X and can increase the bet of 120 times! Level 1: You will take 10 free spins if you land Scatter symbols. Level 2: You can take free spins with Multiplier Wilds when Nitro symbols appear on the same reel. Level 3: On your screen you can see “Nitro Collect Meter” which is filling up by Nitro symbols. After accumulating Nitrosymbols, you are going to the next level of competition where another driver is competing. Drive: Multiplayer Mayhem is the perfect reincarnation of the street racing with excellent levels of free spins and generous multipliers in the base.The game is suitable for all players and has high 96.9% RTP which can result in massive wins. Play now the “Drive: Multiplayer Mayhem” slot at: Betsson Casino, Royal Panda Casino and GDay Casino.